There’s a lot of hype around cacao in the health and superfoods world right now, maybe even as much hype as matcha! But is cacao really as good for you as everyone is saying? 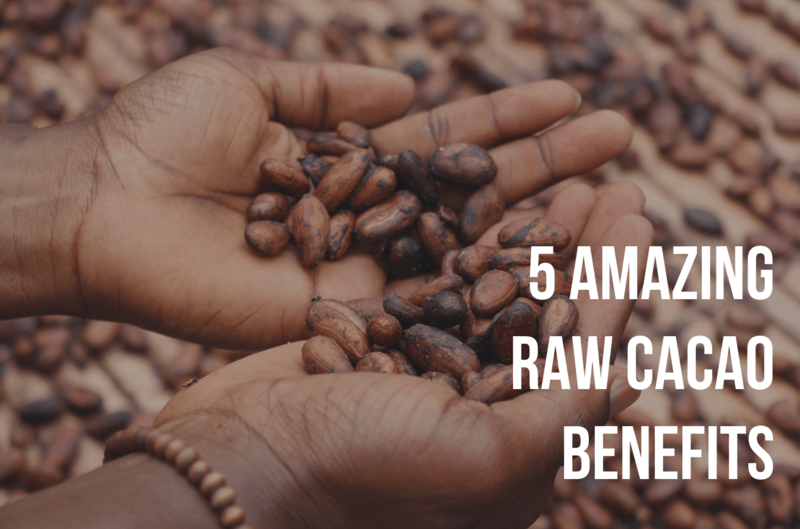 Let’s put to rest some of the myths surrounding this amazing superfood and go over cacao’s benefits, no hype – just facts. But first, what is cacao? Cacao (pronounced cu-cow) comes from the Theobroma Cacao tree which literally means “food of the gods”. It has been sought after for over 5,000 years and was considered sacred to ancient Mayan, Aztec, and Inca civilizations. When cacao is processed into cocoa many of the wonderful antioxidants and nutrients are lost or degraded by heat. Even though dark chocolate is often over 60% cacao you’re losing out on a lot of the benefits. The “dark chocolate is good for you” myth is really “dark chocolate is better for you than milk chocolate because it has more cacao”. If you really want to get the health benefits of cacao you’re going to need raw cacao powder or cacao nibs. There’s a reason why cacao is one of my favorite superfoods for smoothies! Actually… there’s 5! Raw cacao truly is nature’s antidepressant. It’s a well studied phenomenon that chocolate makes us feel good, that’s one of the reasons it’s so popular as a Valentines Day treat. The happy cozy feelings associated with chocolate come from 4 major feel good chemicals found in cacao – Serotonin, Tryptophan, Theobromine, and Phenylethylamine. So next time you’re feeling down reach for the cacao! Or better yet, a cacao smoothie. Raw cacao is one of the richest antioxidant food sources available. Cacao has an ORAC score (a measurement of the amount of antioxidants) of almost 40x that of blueberries! Antioxidants destroy free radicals and play a core part in the prevention of disease and illness throughout the body. Flavanols are one of the main antioxidants in cacao and they’re especially important for heart health. These flavanols increase blood flow which helps deliver nutrients throughout the body. Increased blood flow helps lower blood pressure and promotes skin and brain health. Cacao is an excellent source of magnesium – one of the most common mineral deficiencies in modern diets. A magnesium deficiency is associated with symptoms of fatigue, anxiety, and irritability. Cacao is also a great source of theobromine – a compound similar to caffeine. Theobromine’s effects are less pronounced but longer lasting than its cousin caffeine. If the other benefits of cacao weren’t enough to convince you to try this delicious superfood, cacao can also help with weight loss. It has been shown to not only increase you metabolism, helping you burn more fat, but it also acts as a natural appetite suppressant. If you’re trying to lose weight I recommend my creamy peanut butter cacao smoothie. It’s perfect for satisfying dessert cravings or as a filling meal replacement to start off your day! Cacao is usually consumed as nibs or powder. Nibs are simply dried and lightly roasted cacao beans while the powder is dried and ground cacao beans. I prefer the powder over the nibs. Cacao nibs are a delicious snack but have slightly lower levels of antioxidants than the powder form. The serving size for cacao powder is about 2.5 tbsps. Because of its delicious chocolate flavor, cacao fits perfectly in almost any dessert recipe. Anything with chocolate would probably be good (and better for you) with cacao. Ok so I might be a bit biased on this one but seriously it's great! It's the perfect breakfast smoothie to fill you up and put you in a happy, energized mood. These sweet treats come from the amazing servedfromscratch.com. They're vegan, gluten free, surprisingly healthy, and packed with protein! This delicious superfood hot chocolate comes from loveandlemons.com. The maca and cacao combine for a healthy and energizing drink thats perfect for the cold winter months! You should be able to find raw cacao powder and nibs at any organic food store, but I buy my dry goods and non-perishables online. I’ve actually been able to save around 30% on my grocery bill just by shopping online! Shopping online allows you to quickly compare prices to make sure you are getting the best deals. I’ve found Thrive Market (an online organic/health food store) to have the best deals. You can find more info on Thrive Market and the potential savings in this review that I wrote. Amazon is another great option, I always check prices on both sites because prices are constantly changing. The brand of cacao powder that I personally use is Navitas Organics. I find Navita’s products to be really high quality but also fairly priced.